Forum - Showing off » 20 x 30 "The Lab"
20 x 30 "The Lab"
pic 3 - worm bins in the corner. i have to re-design this seeing as how the original design doesn't accurately represent what it would actually look like. a compost bin, and a bin for amending soil. pic 4 - is just a shot of the whole space. RE: 20 x 30 "The Lab"
16x20 x8 ht shed with a storage shelf on top. Like a tuff shed barn. I will be asking questions when I am building my rooms..
Nice Shortbus, which program did you use to make that? I wish I could have a grow room like that............ I'd retire at 50 and grow. grow, grow. You going to control odor SB? As tall as your plants could be I'd go with the 1000 watters. -buckets (in flower) on ground level = no siphon action. raided up on 4" or 6" would make for easier draining. 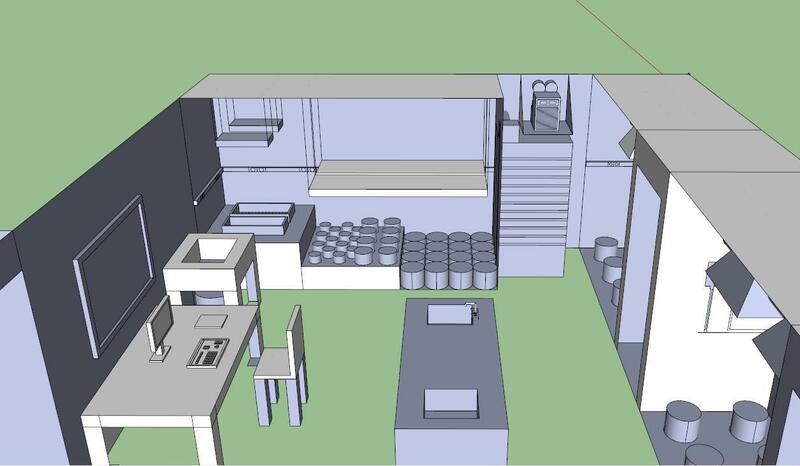 have you see the pictures of the grow-room setups in semi-trailers or those international shipping containers? and i will gladly answer. keep in mind this "lab" was not designed with any intentions to maximize output of the particular space. it's my version of a what a growers "man cave" would look like. yeah, odor control is on the list of things to add. i'll prolly put another 60 hrs into this before i call it complete. i prefer my light's to remain in a fixed position, while raising and lowering my plant's as needed. by having the lights in a fixed position you can maximize air flow within the duct, and air cooled hoods, allowing you to use smaller fan's more efficiently. i use smart pots with run-off tray's on all my grows. i prefer to water less, more often. i build the veg and flower rooms with the intent of using exterior french door's. tent's would work as well, and in the long run end up most cost effective then constructing the rooms yourself. the advantage of constructing the rooms yourself, is they will be more air tight. which will allow you to seperate the atmostphere within the grow spaces from the general working area. i think this is especially effective when attempting to keep the flower rooms at 1500ppm of c02. while the general area remains relatively normal. yeah i've seen the trailors. there's a few companies that do enclosed trailers that you see landscapers using, as well as trailers they use to transport motorcycles and cars in. some really cool stuff. man cave???? i see me in there just fine...what a great space...fun stuff right there. the flower area's are 4x8 each. and i totally agree with the moving propagation rack. i saw a few of them on amazon. i would deff get one. the biggest reason for the island with the dual sinks, is because i was planning on putting in a sub critical/super critical c02 extraction chamber, as well as a high powered microscope, and Bunsen burner.